Enter Your Treecycler™ Code: Register code ? No thanks, I'd just like to look around. Have a Treecycler code? Enter it here to view the available projects and select the one you wish to support. Don't have a code or don't want to enter it now? No problem! You can still view all of the reforestation projects that Treecycler supports. Together with Treecycler you can take a small step towards making our world a more beautiful place. Continue to the map to plant your tree. What do I do here? 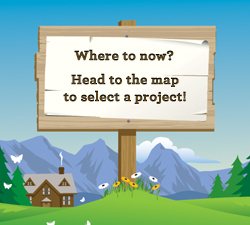 Search the map, choose a project, plant a tree. Where do I get a code? Find Treecycler codes on things you use everyday. This program works with a diverse group of partner organizations on local tree planting projects that will provide fuel wood to women. Restoring the forested areas along the banks of tributary streams to reduce erosion & flooding and protect property, water quality, fish and wildlife. This reforestation program has several projects spread throughout Uganda and focuses primarily on providing trees to local communities. Liberian 4-H youth create sustainable tree nursery projects at their schools to learn about conservation and spur economic development. Ghanan 4-H youth create sustainable tree nursery projects at their schools to learn about conservation and spur economic development. Just planted a tree in New York and 2 other locations. Just planted a tree in Senegal and 4 other locations. Just planted a tree in Kentucky and 1 other location. Just planted a tree in Kenya and 1 other location. Just planted a tree in Maryland and 1 other location. Connect with Facebook What is this?